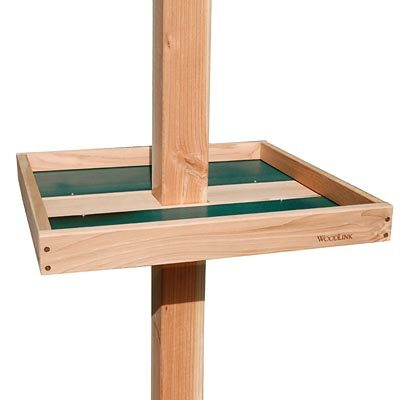 Add more dining area beneath your existing, post mounted bird feeder using this Woodlink Giant Post Mounted Seed Tray with 4 x 4 Adapter. This package includes a fantastic, cedar framed platform feeder, along with a steel adapter to keep it secure on your existing wooden 4 x 4 post. The lasting, Woodlink Giant Post Mounted Seed Tray holds 7 quarts of sunflower seed or peanuts in the shell on its powder coated, metal platform, and perforations here allow water to drain with ease. An additional, 6.25" wide, cedar slat creates the center of the tray for strength and support, and the 3.625" square opening here makes mounting the unit simple. Attach the included Audubon 4 x 4 Steel Mounting Bracket to this center panel, and ensure the adapter's opening aligns with that of the feeder tray. Slide the mounting plate and platform over your existing 4 x 4 post (not included), and screw the extended triangles of the bracket on to the wooden post to keep the assembly perfectly in place. The steel construction and black, powder coated finish of the adapter form a durable base, while the cedar feeder frame is sure to last for many seasons. Offer birds a wealth of perching and dining area beneath your existing, post mounted feeder with this Giant Post Mounted Seed Tray with 4 x 4 Adapter. Feeder made in the USA. Feeder Capacity: 7 qts., 10.5 lbs. Erva Patio Base for 4 x 4 Post, 24" dia. Peanuts in the Shell, 25 lbs. Medium Sunflower Chips, 25 lbs. Droll Yankees Giant Seed Tray and Squirrel Guard, 18.5" dia.